Go Green and Save Time! Read More. Download any piece of Simpson Strong-Tie literature right now! Digital publications save time, money, and the environment. Instead of ordering literature by mail, download a piece of literature to you computer right now. It’s fast and it’s free. Print only the pages you want. Read more about the benefits of digital publications. Click the links below to download, view, and print PDFs of catalogs and more. 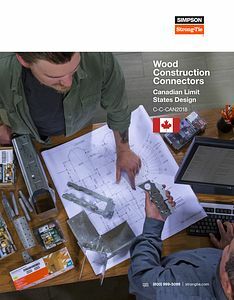 The Wood Construction Connectors catalog (C-C-2019) features product information, including applicable specification and installation instructions, for wood-to-wood and wood-to-concrete structural connectors. 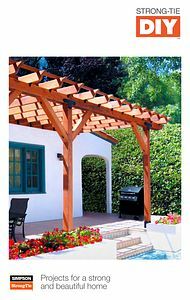 It is an indispensable reference document for anyone planning a wood structure. This 340-page catalog includes both new and updated load tables, material specifications and installation guidelines for our comprehensive product line of connectors. Application drawings are provided to clarify installation. Replaces C-C-2017. 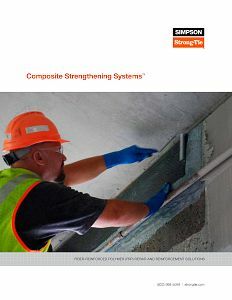 A complete product and application catalog including load tables and installation information for more than 3,000 wood-to-wood, wood-to-concrete and wood-to-masonry connectors. Replaces C-C-CAN2015. Un catalogue complet de produits et d'applications comprenant des tableaux de charges et d'informations d'installation pour plus de 3 000 connecteurs bois-bois, bois-béton et bois-maçonnerie.Reemplaza C-C-CAN2015CF. Designed specifically for installers, this guide uses detailed graphics and minimal text to visually explain how to install many of our key products. It fits nicely in a pocket for easy use in the field. In English and Spanish. Replaces S-INSTALL14. Diseñado especificamente para los instaladores. Esta guía utiliza gráficos detallados con un texto mínimo para poder explicar visualmente cómo se instalan muchos de nuestros productos clave. Entra muy bien en el bolsillo (de la persona) para un uso fácil en la obra. En Inglés y Castellano. Reemplaza S-INSTALL14. El C-C-2017SP es un catálogo de 388 páginas que incluye información sobre nuevos productos, así como cualquier especificación aplicable e instrucciones de instalación para conectores estructurales de madera a madera y madera a concreto. La publicación incluye tablas de carga nuevas y actualizadas y especificaciones del material. Reemplaza C-2013SP. The C-A-2018 is a 260-page comprehensive products and information catalog for the Anchoring, Fastening and Restoration Systems products for Concrete and Masonry. Replaces C-A-2016. El C-A-2018SP es un catálogo completo de productos e información para los sistemas de anclaje, sujeción y restauración para concreto y mampostería. Reemplaza C-A-2016SP. The 2016 Product Guide for Anchor & Fastening Systems provides information on adhesive and mechanical anchors, as well as direct fastening, carbide and restoration products. Replaces S-A-PG14. Learn how our FX-70® Structural Repair System can save time and money on pile repair projects. Eliminate the need for dewatering, coffer dams and reduce downtime. Replaces F-R-FX7014. A flier introducing FRCM, the next generation of Composite Strengthening Systems for concrete and masonry structures. Includes features, benefits and common applications. This catalog is not available in North America. Written in Japanese using metric load tables and standard Japanese fastener sizes. Contains Simpson C-Mark approved connectors for 2x4 wood construction, I-joist hangers and other products. The Deck Connection and Fastening Guide is intended to help designers, contractors, inspectors and do-it-yourselfers ensure that their decks are properly constructed per the International Building Code® (IBC) and International Residential Code® (IRC). Replaces F-DECKCODE13. A 12-page guide illustrating the requirements surrounding the repair and protection of plumbing, HVAC and electrical in various building codes. Extensive drawings make this an easy-to-use resource. Replaces F-REPRPROTECT09. The F-L-SRS18 is a 76-page design guide explaining how to specify Strong-Rod anchor tiedown system for shearwall overturning restraint and uplift restraint systems for roofs. Replaces F-L-SRS15. The C-L-SRSCAN18 is a 76-page Canadian limit states design catalogue for Strong-Rod Anchor Tiedown Systems. It includes product information, design methods, and pre-engineered runs using shrinkage compensation and other components. Replaces C-L-SRSCAN16. The F-L-SF17 is a 100-page design guide on Strong Frame® moment frame design requirements and considerations, including methods of specification, product, anchorage and installation information. Replaces C-SF13. The C-L-SW17 is a 100-page catalog for the Strong-Wall shearwalls, including the new Strong-Wall wood shearwall. It contains product data, engineering design information, installation and anchorage details. Replaces C-L-SW14. The C-CF-2017 is a 308-page catalog including specifications, load tables and installation illustrations for our cold-formed steel connectors and clips, helping you easily specify and install in commercial curtain-wall, mid-rise and residential construction. Replaces C-CFS-15. Un catálogo que incluye especificaciones, tablas de carga e ilustraciones de instalación para nuestras abrazaderas y conectores de acero moldeado en frío. Este es un producto nuevo. 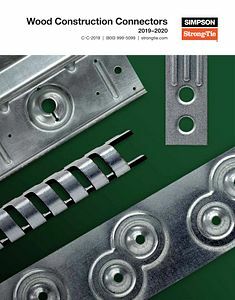 A booklet featuring practical and attractive DIY projects for home and yard using Simpson Strong-Tie connectors and fasteners, including Outdoor Accents®. Replaces S-HOMEPRJCTS14. The newly updated High Wind-Resistant Construction Application Guide offers new applications, updated loads, as well as more fastening information that is used to resist high-wind. Replaces C-HW12. The C-F-2017 is a 404-page full-color catalog containing Simpson Strong-Tie fastener solutions, including our Strong-Drive®, Deck-Drive®, Quik Drive® and stainless-steel product lines. This piece provides product information, features, benefits, product model numbers, specifications and technical information (engineering load tables, spacing diagrams, installation instructions, etc.). Replaces C-F-14. Un catálogo a color que contiene soluciones para sujetadores Simpson Strong-Tie, incluyendo nuestras líneas de productos Strong-Drive®, Deck-Drive®, Quik Drive® y acero inoxidable. Reemplaza C-F-15SP. The S-F-FASTNRPG18 is a multi-page 4.875” x 8.25” spiral bound product guide for Fastening Systems. This piece is intended as a job-site reference guide of product related information for Simpson Strong-Tie screws, nails, Quik Drive auto-feed systems and accessories.